Okay, first, even before you get anything started, you will need to identify the utensils you are going to use in cooking this. You will need one utensil (and I am going with a bowl here, because puddings are really bowl things!) in which you will cook the pudding (the cooking bowl), and another bigger bowl, in which you are going to place the cooking bowl while cooking. Both the bowls have to be oven AND flame proof, so I used steel bowls. You will also need three other suitably sized mixing bowls, ideally of 500ml capacity each, to give you plenty of room to whisk. Break the eggs into the first mixing bowl. Add the sugar and whisk well for 3 minutes. Set aside. Pour half (250ml) of the fresh cream in the second mixing bowl. Add the instant coffee powder and whisk well until the coffee dissolves in the cream. Pour the other half of the cream in the third mixing bowl. Add the vanilla essence and whisk. At this stage, it would be good to start pre-heating the oven to 200C. It would also be good to pour about 2 inches of water in the bigger steel bowl and put it on the gas to boil. Give the egg and sugar mixture a quick whisk, and pour half of it into the coffee cream mixture. Whisk well until incorporated. Pour the other half of the egg and sugar mixture into the vanilla cream mixture, and whisk well until incorporated. Pour the vanilla cream mixture into the cooking bowl. Then, pour the coffee cream mixture on top of it in zigzag, circular or uneven motions, and make sure to not whisk or mix the two at all. This will create a pattern resembling a marble cake. Take the bowl with the boiling water off the gas, and put the cooking bowl in the hot water. Take care to ensure that none of the hot water gets into the cooking bowl. If need be, you can throw out some of the water. Place the entire thing in the preheated oven, and bake for 45 minutes, or for as long as the pudding needs to set. If the top seems to be getting burned or too browned but the pudding is not set yet, you can use the classic technique of covering the cooking bowl with a foil tent to prevent burning. Take the pudding out of the oven, pour the water out and allow the pudding to cool to room temperature. Then, pop it into the refrigerator for an hour or so. Voila! Your Crème Brûlée Symphonie is ready… I did not feel the need for a caramel topping, but if you want, you can add that too on top! Bon appétit! Chicken Rashness - A Chicken Recipe with a Rashness! Have you ever had one of those moments, when a most rashly invented, on-the-spur recipe actually turns out great, and then you don’t remember the recipe? Well, I had one of those just now. So why am I writing about it? Well, I had this great idea (born under the influence of half a bottle of wine, no doubt!) that if I try to write it out, I might actually recall the recipe. I don’t know the scientific basis for such an assumption, but what the heck… it’s my blog – I can write what I want, even though it is utter rubbish! Two cloves of Garlic, finely chopped. One large leek, finely sliced. One medium sized tomato, roughly chopped. Salt, Pepper, whatever herbs you can lay your hands on – I used thyme, sage & rosemary – to taste. Half a can of baked beans (200g approx.). Anchovy paste – 1 tsp. Oil / Butter – 1 or 2 tsps, depending on how healthy you like to eat. By the way, I used anchovy fillets preserved in sunflower oil for the paste, and used the preservation oil for cooking – gave it extra flavor, I’d like to believe! One boneless chicken breast, cut in half if you want – I did. In a saucepan, pour the oil / butter. When it heats up, add the garlic. Cook for a few seconds. Add the sliced leeks. Cook for a while, till slightly softened, then add the tomatoes. Add the salt, pepper and herbs at this stage – it releases the juices of the vegetables better. Cook for 2-3 minutes. Add the anchovy paste, baked beans and water. Bring to boil. When the chicken is nearly done, add the honey and mustard sauce, and keep stirring and cooking till the chicken is done and the gravy has become thick. Remove from heat and serve with a side of bread, polenta, rice or Yorkshire Pudding, for all I care! There. I believe my idea actually worked! I think I remembered the recipe in full – or did I?! Eh well… If any of you adventurous folks do try this recipe out, do let me know if you were as enthralled by the outcome as I was. If not, I’ll know I’ve missed something… or the wine had mellowed my taste buds. Either way, we’ll know! So, I totally had to write about this one. I mean, it would’ve been a crime not to. So enthusiastic I was, that here I am, sitting in the sit out area of The Misty Mountains Retreat, and writing about the retreat itself, the journey, the experience and the people I met here! It all started when I found I had ten days off work, and absolutely nobody to accompany me anywhere. Added to my phobia of spending Pujas in Kolkata, I started searching for some holiday spot, resolved to go it alone – and I typed “offbeat holiday destinations” in Google. After hours of searching, I found that most of the “offbeat” destinations were not so offbeat after all – as evidenced by the fact that they unabashedly offered wi-fi connectivity and multi cuisine restaurants. I was nearly resigned to fall back on my all time favourite spot – Pelling, Sikkim – when I chanced upon this place. The Misty Mountains Retreat. Approximately an hour of researching on the spot, the resort and the location later, my mind was made up – this is where I wanted to be! So, quickly getting the Logistics over with – the nearest railway station is Kathgodam, the nearest Airport is New Delhi. You can connect as per your location and convenience. I flew in to Delhi, and then took a train from Anand Vihar Railway Station to Kathgodam. From Kathgodam / New Delhi, you can drive / hire a car to reach this place. Yes. That is the only way. From Delhi, it takes about 14 hours, and 7 hours from Kathgodam, to get to this place. One goes through Bhimtal, Almora, Raiagar to get here. After Raiagar, if you think the driver has led you astray with malicious intentions, you are probably wrong. Yes, I said “probably”. There is always a chance that you may get robbed and stabbed to death – after all you are only mortal and probably immensely rich! Therefore, it might be best if you ask Madhur, the owner of the Retreat, to arrange for the cab. Even after that, if you think that the driver is duping you after Raiagar, rest assured, he is not. For The Misty Mountains Retreat is, really, in the middle of a virgin forest (read, in the middle of nowhere). After Raiagar, for about an hour, you will be driving through a road that is not even a road – more, a trail. A map of the route is given below for convenience. Now, may be you are wondering if this place is worth all that trouble. So, let’s get one thing clear right at the beginning. If you are looking for a holiday destination where you have 3G and wi-fi coverage, ATMs, places to buy medicines and batteries for your camera if you run out, temples to go to pray for your kid’s grades, clothes boutiques and fancy curio shoppes, this place is not for you. (Madhur will never forgive me if I am responsible for sending another buffoon who asks for an ATM in the Retreat!) But if you want to witness Mother Nature in all her glory, or speak to birds that could teach Camlin a thing or two about colour palettes, or have an adventurous urge to challenge the Himalayas, or marvel at the number of stars that the sky can hold, or just simply want to reinvent yourself, look no further. This is the place you want to be in. Then there is the Retreat itself. The décor of the rooms, the layout of the resort, the cute little sit-out areas where you can enjoy a cozy chat or simply look at the beauty of the Himalayas and the cool hammocks hanging around the place, all make the Retreat beautiful. The rooms are clean, the beds are soft and the blankets are comfortable – you even get an electric blanket if it’s too cold! But the real beauty of this place lies in its being in the middle of nowhere! 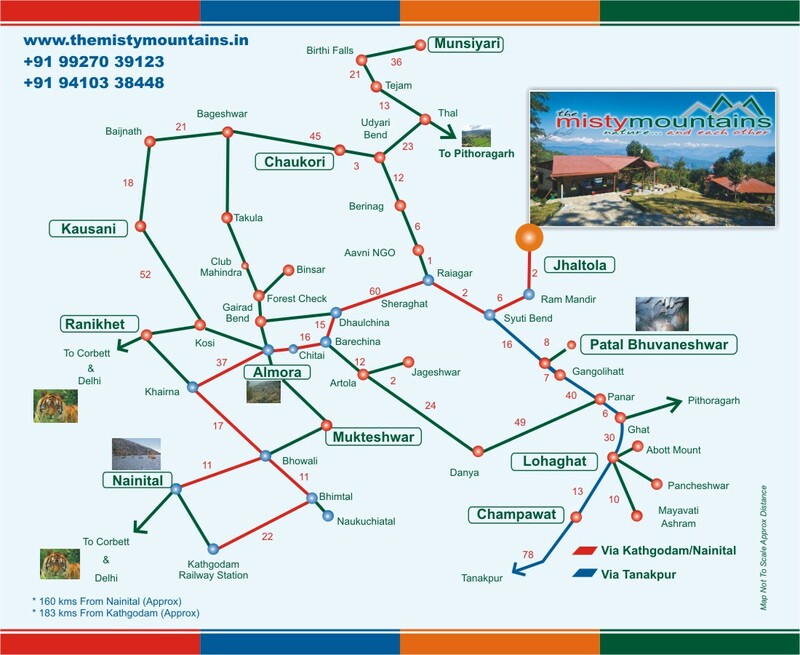 The Retreat is spread over almost 5 acres of land amidst the forest. The flowers around the place are not managed by any gardener – they grow on their own, with little or no help from Ambika (Madhur’s wife and co-owner of the Retreat, fondly known to most as Kuna). The three pet cats of Kuna, Brownie, Musasa and Ai-Ai, are as much a part of the Retreat as are the trees and flowers. And the food, though cooked as simply as at home, will definitely make you over-eat and gain as many kilos as you lose trekking! 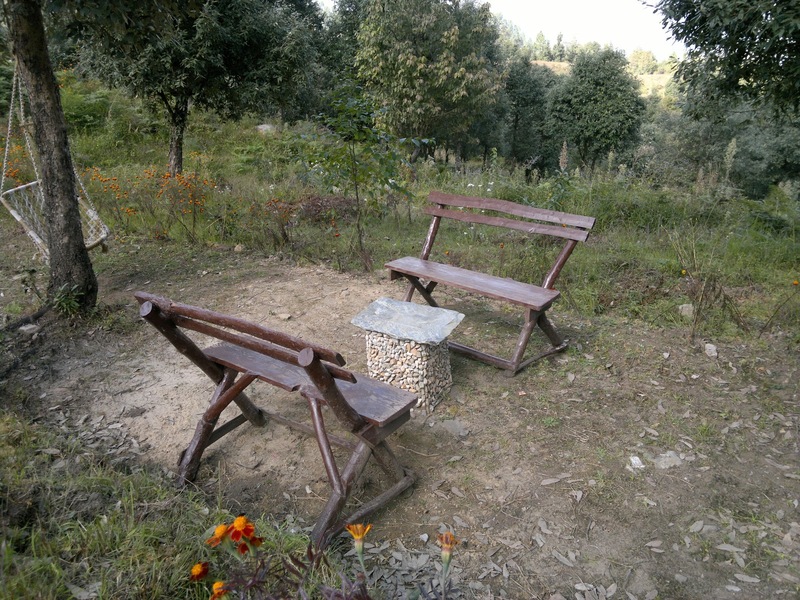 The Retreat, within itself, offers several things to do during your stay – I won’t reiterate the ones that Madhur has already listed on his website, but I will tell you this: if you are a nature enthusiast, and especially like bird watching, then you would probably find yourself being taken trekking around the place by Madhur and Kuna themselves! And I tell you, it would be worth the experience, for these two know the place like the back of their hands, are charming hosts and have a gift of endearing themselves to you without really trying! I am now back. To my drab existence in Kolkata! And it is here that I am finishing this post. I was at the Retreat for almost seven days, and there was never a dull moment - and the farthest that I went from the Retreat was to Lamkeshwar! You might be thinking, “what will I do there for seven days? !” For that, you need to visit the website. But even apart from that, I assure you, I witnessed the regrets of the visitors who were there for only two or three days. Well, to be honest, I regretted leaving too, even after seven days, but that was because I never like my vacations to end! If I had it my way, I would have stayed on forever! That was not to be, though... But if you do decide to visit The Misty Mountains Retreat, and you don’t have a month to spend there, definitely spare a week. Otherwise, you will not do the place justice. You will not do yourself justice. And you will definitely come back unsatisfied! If you'd like to see my memories of the Retreat, you might want to click this link: Holiday at The Misty Mountains Retreat. 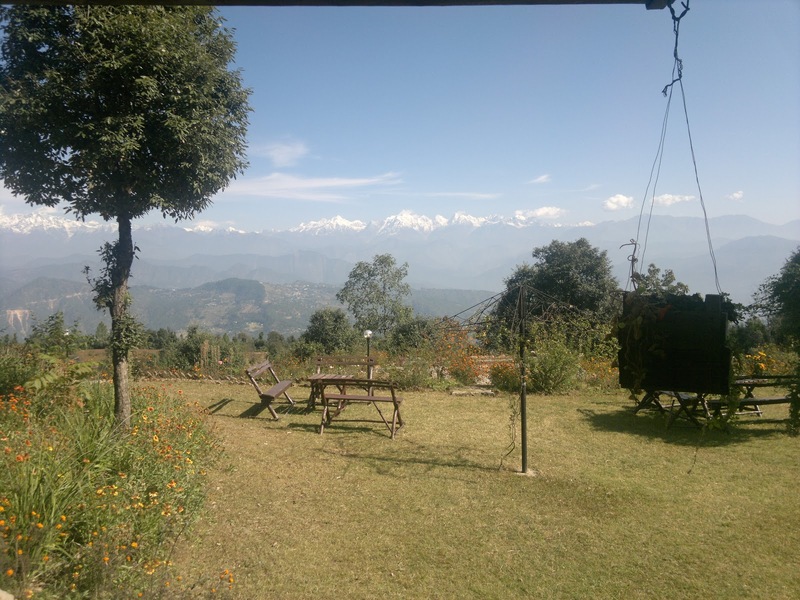 For pictures of the Retreat itself, well, Madhur has a website: The Misty Mountains Retreat. I stare at the blank pages. There is so much on my mind, yet it is so difficult to put them in black and white. My heart trapped inside my feelings… my head, rationalizing, in a vain effort to drive those bitter, scary thoughts away… conflicted, confused and yet, with all outward appearances of sanity and cheer… as if life has dealt me nothing but the best hand! My pining increases exponentially for the things I most certainly will never be able to have… a family, someone to call my own, unconditional love and acceptance. And yet, I push away every opportunity of getting something even close to that. I am jealous of even the most unfortunate of people around me… because they have something that I can never, ever have. I realize that some people care for me and want to fill the void, but I am scared to let them. Sooner or later, I tell myself, they will drift away, and the void will rush forth to consume me once again… isn’t it better to just get used to it and mourn, than to forget it for a while and then remember it all over again? I remind myself of a dam sometimes… when the rains are bountiful, they open the gates. Or else, the force of the walled up water will cause cracks in the walls, and soon the entire dam will come crashing down in a flood. I feel my defenses around my dammed emotions starting to crack. But I am afraid of opening the gates… will I ever be able to dam up again? But what’s the point. Who will understand my pain anyway? Empty words, and heartfelt pity – that’s all that I will get… not enough, not nearly enough to cure my writhing heart. And so, I write. I don’t know why. Perhaps in the vain hope that someone, someday, will understand the pain hidden beneath these words… or maybe, just to open the gates and let the tears flow. I have been working on this “come back” piece for ages now… thank god for e-age, or else several trees would have found themselves axed, martyred to the cause of completion of this epic piece! Well, I have nothing to write about. No genius plots come to my mind these days, and rhyme and/or reason seem lost. I have even run out of steam with my ramblings! And yet, tonight I am determined – I will churn out something! So here I am, writing about not being able to write any more… eggs and brickbats notwithstanding. They say, (and I am not very sure who “they” are) pain is a writer’s elixir. Creativity is born out of pain. Of that, I have had a considerable amount in the last few months. I expected my pen to start over flowing, but nothing happened. I found myself even more clammed up than usual. A shrink would have a million explanations for that, I guess. I don’t want to face reality. I don’t want to acknowledge my losses. I am scared of the intensity of my emotions. Maybe. I really do not know whether any of that is correct. Or incorrect, for that matter. These days, I am not certain of anything. Many well wishers have been advising me to get married. I am scared. And if they had been in my shoes, they would be scared too. If you cut your finger on a broken mirror once, you tend to handle all mirrors with more caution than usual, because you don’t want to cut yourself again. The same goes for your heart, doesn’t it? Nothing in my life works out the way I want it to. Who’s to say marriage will? Of late, I am aware of a growing affection towards a person. And I am afraid of it. I do not know whether he feels the same way. I do not even know whether I want him to feel the same way. Neither do I know whether I want it to stop or go away. I am scared and confused. Not to mention emotionally drained and battered. So much uncertainty and pain. In my life, my mind, my thoughts… the pain has reached an extent where it is now an integral part of me. A way of existence. I do not feel anything separately. In a way, I am numb. Perhaps that is why I cannot write. For creativity to be born out of your pain, you need to feel the pain. But I don’t. I can’t, anymore. I am numb. There… now you know the reason for my writer’s block! So now, maybe, we should concentrate on how to get over it. And here comes the funniest part. Pretty much wasted and jobless, I was typing out random senseless queries in the Google search engine, and “how to get over writer’s block” threw up “about 8,880,000 results” in only “0.17 seconds”! Wow!!! And I thought, well, I have the writer’s block, and if so many people around the world have written about writer’s block, why not add my name to the list?! So, what follows below are some of the funniest things I read among the 8 million results thrown up by Google… of course, I did not go through the 8 million results – more like 80, but there were more than enough funny ones among them to get me through this article! On the Yahoo! Answers page, someone has asked about how to get over writer’s block on a particular story, and another user has replied, “Read, write”… Yes, that’s it. Verbatim. Just that. I was stunned by this excellent piece of advice! On yet another website, the author recommended gathering topics / plots from Twitter – “find out what people are talking about” and then write about it!! Oh goodness, what a divine cure for writer’s block! One person recommended downloading OmmWriter – supposedly, my sickly blue background of MS Word is aggravating my case of writer’s block! One person actually suggested writing about writer’s block to get over it!!! He also suggested having a peppermint candy… strangely enough! He reckons it stimulates the brain cells… of course, he didn’t quote his source for that information!!! Well, the effect of these articles was quite good on my writer’s block. It must be evident to you too, because I did manage to churn this out, didn’t I?! Voila!!! Bye bye, writer’s block! It seems, in my case, outrage and sarcasm work better than mind-numbing pain to get those creative juices flowing! Oh, and for those of you who are wondering, yes, of course I found some good articles too on battling writer’s block. But taking a leaf out of them, I will write another article on them, so as to officially put my writer’s block behind me!